With many varieties offered Cistus are a hardy group of evergreen shrubs that once established are reasonably drought tolerant. 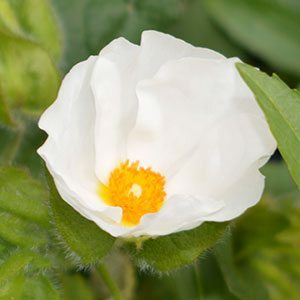 Often referred to as the ‘Rock Rose’, these are an excellent plant in the garden border where they require very little care, also useful as a ground cover plant. Cistus ladanifer is referred to as the ‘Gum Cistus’, C. salvifolius is the sage leaf rockrose, while C. monspeliensis is the ‘Montpelier Rock Rose’. Cultivars such as ‘Brilliancy’ are amongst the most popular of this hardy group of plants. Narrow deep green foliage and brilliant pink flowers with crimson markings make this a standout. How tough are they ? We have seen them used in mass plantings in shopping centres, car parks and roadside areas where they receive very little extra water or extra care. How big will they grow ? To around 1m with a slightly larger spread. These are a low growing hardy shrub or ground cover. 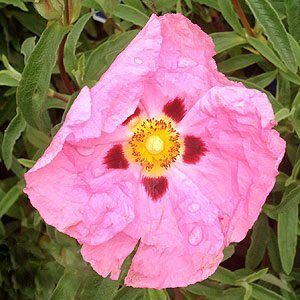 Sometimes called the ‘rock rose’ Cistus have pink to white paper like flowers, attractive to bees. Hardy and drought tolerant once established, Cistus can be pruned back lightly after flowering to maintain shape.